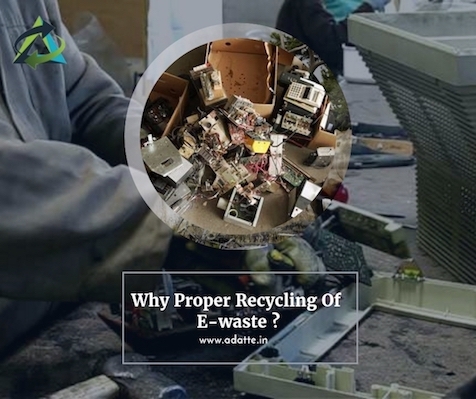 Why proper recycling of e-waste? E-Waste consists of more than 30 elements, which include metals (ferrous, non – ferrous, & precious) & non-metals (plastic, fibre, resin, glass, etc.) in varying composition depending on the type of device. The metals present also include some hazardous metals such as cadmium, mercury, lead etc. These metals don’t pose a significant threat by being present in electronics, but the improper/informal processing of e-waste is dangerous due to the presence of these metals. Though at present, all elements (especially metals) cannot be extracted even by proper/formal recycling, due to the lack of technology, economic viability, and the trace quantity of some of the metals, the proper/formal recycling ensures environmentally sound disposal of E-Waste. India is already dependent on other countries for metals (especially precious metals), and also the extraction of minerals through ore is much more costly and resource consuming than the recycling of metals. Hence the proper recycling of E-Waste poses a great benefit both economically and environmentally. Next Next post: Where Do 50 Million Tonnes a Year of Toxic E-Waste Go?